Gantry cranes are often used for applications requiring versatility in daily operations. They’re designed to provide multi-purpose lift and transfer capabilities for heavy loads in a variety of applications. Considering maintenance and repair operations can occur on site or from one location to another, flexibility is a crucial crane factor. Gantry cranes are (generally) designed with three primary components: two leg structures in a basic A-frame shape and a wide-flange or I-beam span. Unlike standard jib cranes, which consist of a boom and mast with only one support point at the base, gantry cranes carry the weight of the load using both leg structures. The basic A-frame gantry design generally includes wheels on the end of each leg structure, which makes them easily transferable. This special support structure enables only one or two workers to manually move the crane under load from one point in the facility to another. Because they don’t rely on building structural support to carry the weight of the load nor do they require any permanent installations or secondary foundations, they’re a perfect option for maintenance and repair operations—in and outside of the factory. While maintenance and repair applications vary from operation to operation, one major factor in deciding which gantry crane best suites your operation is environment. In-factory gantry cranes are easily transported from one work area to another for quick maintenance and repair, which is arguably one of their greatest benefits. Depending on the size of the gantry and the load, one or two workers can simply roll the entire crane to a new location within the shop and lift materials as needed. They are equipped with polyurethane tires for easy indoor movement and can even be track mounted for manual or motorized travel over a fixed route. However, because most maintenance and repair applications require workflow changes, portable or re-locatable gantry cranes are a more practical option. 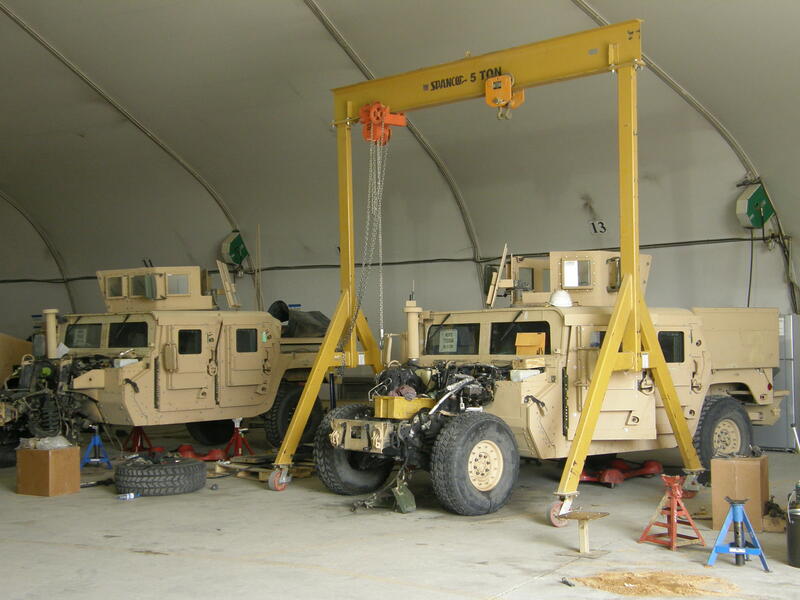 For facilities that perform equipment maintenance and repairs on vehicles and/or machinery, an adjustable steel gantry crane is a perfect solution. Oftentimes, workers have to pull an engine or transmission from inside a vehicle—whether it be an automobile, light rail, or transit vehicle—lifting heavy parts from larger vehicles can be impossible without the help of a material handling solution. Even smaller parts weighing 50-100 pounds can require the help of a material handling system to avoid putting unnecessary physical stress on workers. For applications like these, adjustability and portability are key. Adjustable gantries are often adjustable in height, span, and tread, making them easy to maneuver and extremely versatile. For a transit company that needs to pull heavy electrical cables from rail cars, for instance, a three-way adjustable gantry crane is a great option because it can be transported to any point around the rail car and adjusted to lift from almost any position. These gantries are generally engineered for stability, leaving the I-beam free to pivot as it self-centers over the load. The A-frame design helps to eliminate swaying, and the I-beam can be cantilevered to deliver parts through the end of the gantry up to four feet past the end of the beam. This is especially important when reaching into machinery and lifting heavy cables or large engines that are suspended for long periods of time. HVAC applications almost always require the help of a light-lift system. The trouble with HVAC maintenance and repair is that it often requires a system that is extremely portable and lightweight. While many steel gantries can be easily transported by one or two workers on the shop floor, a steel gantry crane cannot be easily lifted from a service truck or work vehicle and carried from one job site to another. For applications like these, an aluminum gantry crane is an excellent option. Not only can they lift up to three tons, but they can be easily assembled and disassembled and transported in a work truck or similar vehicle. 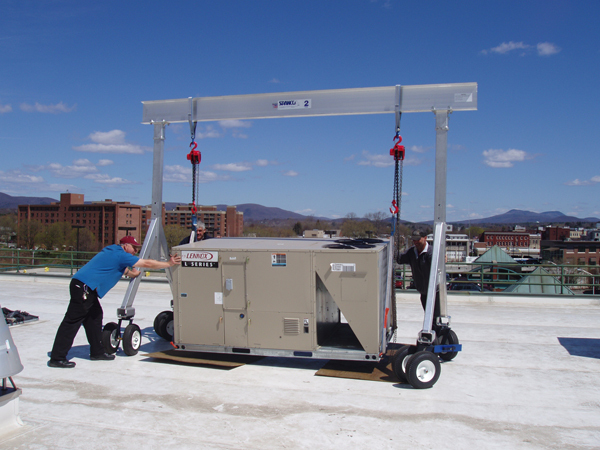 Aluminum gantries can weigh as little as 116 pounds fully assembled (depending on the capacity) making them an excellent solution for workers who have to maintain and repair HVAC equipment on roof tops or in other precarious locations. Aluminum gantry cranes are height adjustable for specific lifts, uneven floors, or maneuverability in narrow or tight spaces. 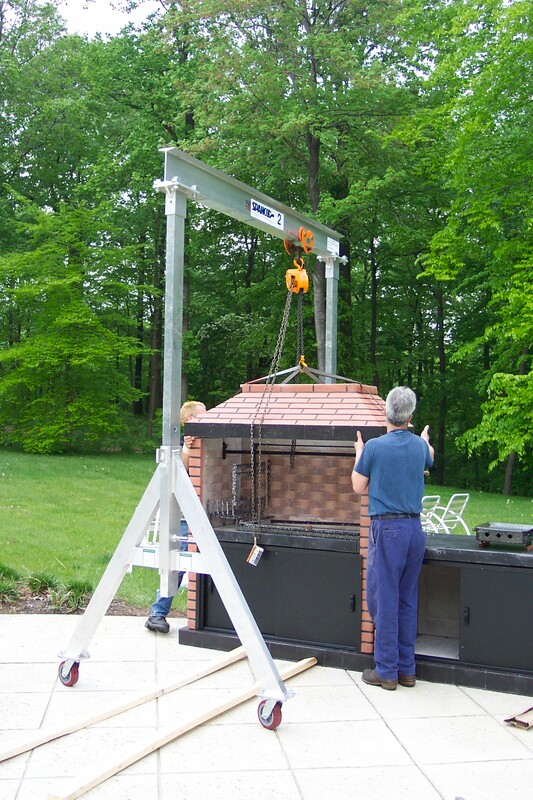 Adjustable spans also allow the crane to be shortened for easy transport in tight locations. They can be customized with pneumatic tires for easy outdoor movement and excellent rooftop protection.